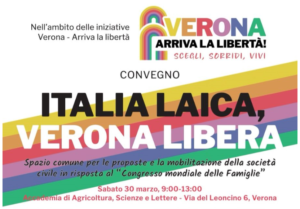 Verona, 30 March 2019 – Italian EHF member organisation Unione degli Atei e degli Agnostici Razionalisti (UAAR) co-organises the event Italia Laica, Verona Libera as a response to the holding of the World Congress of Families, one of the world’s largest international gatherings of ultra-conservative anti-abortion, anti-feminist and anti-LGBTIQ movements which met in Verona on 29-31 March. Poster of the counter-congress co-organised by UAAR, EHF’s largest Italian Member Organisation. The World Congress of families is organized annually by the American International Organization for the Family which has the declared aim of “uniting and equipping leaders worldwide to promote the natural family.” At the top of the list of guests, one can find Italian Deputy Prime Minister Matteo Salvini or the infamous Minister of Family, Lorenzo Fontana, well known for his homophobic stances. American and Russian ultra-conservative groups have been financing and training campaigners in Europe. We can see increasing ties between these groups and far right, sovereigntist politicians and movements. In the context of the upcoming European elections and rising extremism in Europe, we should not underestimate the influence and the objectives of these groups: undermining fundamental rights and European values and impose a reactionary and exclusionary vision of society in European countries. , said Hervé Parmentier, Executive Director of the European Humanist Federation. As a reaction to the holding of this event in Verona, the International Planned Parenthood Federation and Italian EHF Member Organization Unione degli Atei e degli Agnostici Razionalisti, together with the REBEL network, organized the “Italia Laica, Verona Libera” counter-congress to be held on Saturday 30 March. Now more than ever, it is necessary to join forces against the obscurantist wave that seriously threatens to undermine rights that we have work hard to secure over the last years if not centuries, rights that are still far from being fully recognized and protected. , said Adele Orioli, President of UAAR. In its core work, the EHF will keep monitoring and countering the increasing attempts by fundamentalist anti-human rights groups to impose their ultra-conservative views in European policies. For more information on the topic, please download our memorandum for the European elections. Top speakers at the WCF, incl. Matteo Salvini, Italian Minister of Interior, Lorenzo Fontana, Minister of Family and Katalin Novák, Hungarian State Secretary for Youth and Family.